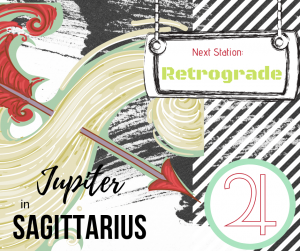 Jupiter stations retrograde at 24°21’ on the 10th of April. We have an opportunity over the next four months to turn inwards and gain deeper insights into spiritual or philosophical issues since our wisdom will flow with more ease from the subconscious to the conscious self. This is also an excellent period during which to seek out underlying beliefs concerning the current matters of the house where Jupiter is transiting in our natal chart. In this way we may come out of this retrograde period with an inner sense of wholeness and confidence in our future potentials and ideals. Sagittarius is the 9th sign of the zodiac, it is a mutable, Fire sign, masculine and diurnal characterised by optimism, love of freedom, lack of tact, unreliability combined with honesty, restlessness and love of teaching (preaching) among many other qualities. Now is the time to contemplate innovative approaches about how we can separate ourselves from previous, personal opinions (or phobias) that have been stifling our inner growth. Perhaps we could also ask ourselves where and how we can make any necessary changes in the matters of the house that it is interested in the transit. For some of us life may become less materialistic and more spiritual as we turn our attention inwards. After his four-month retrograde cycle Jupiter will station direct at 14°30’ Sagittarius on the 11th of August so this transit will affect persons with planets or angles between 28-11° of the mutable signs of Sagittarius, Pisces, Gemini and Virgo. Worth taking note of is also the antiscion degree of the retrograde station at 5°39’ Capricorn. We associate Jupiter, the first of the “superior” or outer planets (affecting the collective rather than the personal) with growth, expansion and luck which, if exaggerated, can also lead to greed and dissatisfaction in some cases, making us believe that the grass is greener elsewhere and so prompting us to explore further. Since Jupiter is the ruler of the traditional 9th (Sagittarius) and the 12th houses (Pisces which he co-rules with the modern ruler Neptune), the axes involved in the traditional zodiac are between the 9-3rd and the 12-6th houses. The 9-3rd axis highlights our awareness of the process of integration and understanding of our ideas and thoughts (3rd) in relationship to their usefulness in our worldly philosophy (9th) and the 12-6th axis wants our soul (12th) to recognize our body (6th) as a vehicle. Jupiter represents, among many other things, foreign travel, ideals, teaching, learning, legal matters, religion, the clergy, indigo-violet-purple colours, the hips, thighs and liver. Consequently we also associate Jupiter with growth, expansion and luck in general which, if exaggerated, can also lead to greed and dissatisfaction in some cases, making us believe that the truth and future are elsewhere and so prompting us to explore further. what was happening then in your life? How can I experience more freedom of action in this sector of my life? How may I increase my positivity and enthusiasm? How can I teach or help others? What are my future plans in this area of my life? Asking yourself this kind of question and listening to your answers will mean using the energy of Jupiter (expansion and growth) to its best during the year to come. This is the teaching of a branch of astrology known as “Evolutionary Astrology”. It’s a way of engaging yourself in your own journey instead of being passive and hoping for the best. The Sabian symbol for 25° Sagittarius: “A chubby boy on a hobby-horse”. Indicating the anticipatory enjoyment of powers one can only as yet dream of utilising. For 6° Capricorn: “Ten dogs lie under an archway leading to darker woods.” Indicating the need to complete any undertaking before seeking entrance to whatever is to be found beyond. What or where do you need to tune down or turn up during this retrograde?